This turn-of-the-century Victorian town-house offers guests a downtown residential home-away-from-home. 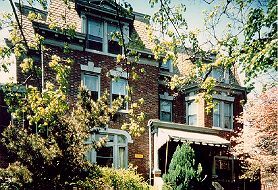 Decorated in period antiques, the guest house is a short stroll from the underground subway, The National Zoo, fabulous dining and quaint shopping. Even though only fifteen minutes from the Smithsonian and the White House, the inn offers the relaxation and hospitality of a country inn with a complimentary continental breakfast and evening aperitif. This and other Washington DC Bed and Breakfast Inns can be found here in The Register. Romantic Country Inns, Getaways and B&Bs offer a great DC lodging alternative to big hotels.